You all know this is the town I live in. Down in the picture below (the one that says 4 miles although it's in the center of town) it says that the town was named by miners because of the apparent volcanic appearance. It's a cool place to live. Has an elevation of 2070 feet and is about 10 degrees colder, in the winter, than the surrounding hills where I live. It's got the St. George Hotel, which serves an awesome Sunday brunch and has rooms available along with being haunted. 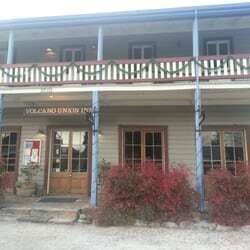 We also the Volcano Union Inn that serves the greatest Lamb hamburger in the world among other tasty entrees. It has rooms available and is also haunted. Don't get excited, haunting in the Motherlode is pretty normal. If you make this plack full size it talks about the gold mining in the area and some of the history. Not why I'm writing this. Just a little background before I begin. As you know, and if you don't, WAKE UP, we're in a drought out here. I was concerned about the level of our well. I only have experience with one other well that I had drilled on some acreage I had in a place called Shingle Springs in the late 1980's. I had to have it drilled to 500 feet just to get 2.5 gallons a minute. Our well produces 19.5 GPM based on the inspection when we bought the house. So, where does one go to get the information about your well that was drilled almost 40 years ago? The Internet, of course. Go to the county records, find out when the permit was taken out to drill, find how deep it is. Simple huh. WRONG. Prior to sometime, no permits were issued for a well drilled in 1976 (house was built that year). BUT there was a certificate of completion required once the well was finished. Cool, where do I find that? Turns out that all those certificates of completion are filed with the Water Resources Board in West Sacramento and all you have to do is fill out the form and mail it to them. There is a moral to this story, so hang on. The following Wednesday (that was pretty damn quick for Government work) I got the report. Remember the well in Shingle Springs, 500 feet deep and 2.5 GPM? Well my well is only 172 feet deep and the report states 15+ GPM. Now the part that relates to this post. They list the levels encountered as they drill in 10 foot increments. Like 0 to 10 feet is topsoil, etc. From 50 feet to 172 feet (the bottom) they encountered lava rock, like lava from a volcano. Sometimes, maybe you shouldn't find things out. Volcanic lava rock 50 feet under where I live? I learned a long time ago to pay attention to names of rivers, lakes and towns, especially those towns that are old. Those folks weren't stupid although I'd have to wonder about that when you have a town named Volcano. Mark, you'd better make yearly sacrificial offerings to the Volcano God. I hear if you don't do that he will get angry and erupt. Volcanos and drought, what more do you need on your plate---interesting name Volcano for any town. From down here in the flat, safe valley... that is a very cool piece of information! Lamb burgers. I had a friend who would season ground lamb to the max, and then eat it raw. So, if I come out to visit you in the future... It will be a quick visit! Lol. Inquiring minds shouldn't be so inquiring sometimes... haha.